Moffat County defender Morgan Lawton plays the ball forward during the first half of Thursday's game against Aspen in Craig. The Bulldogs took a 2-0 lead but saw it disappear in the second half as the Skiers came back to win, 3-2. 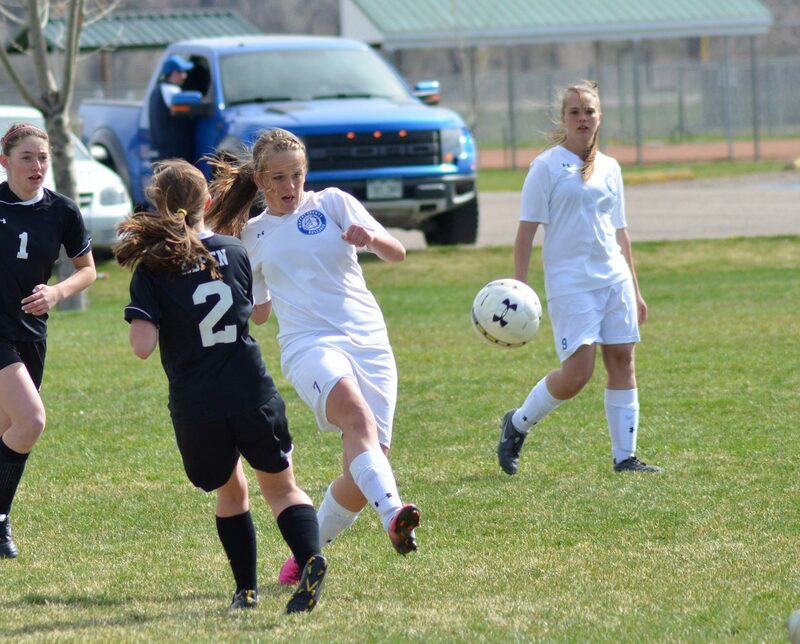 After a scoreless first half, Moffat County girls soccer took a lead but couldn’t hold on in a thrilling Western Slope contest. Hosting Aspen in a key 3A Region 3 game Thursday in Craig, the Bulldogs saw a 2-0 lead disappear and then fell behind late in the game to lose, 3-2. Moffat County (5-6, 3-4 Region 3) and Aspen played to a draw in the first half, with both teams using the entirety of the field and trading possessions throughout. The Bulldogs created more chances early on, but the Skiers came back and dominated the middle part of the half. Moffat County began to apply pressure on offense again late in the half, but neither team was able to finish off strong play forward. On several occasions in the first half, Aspen forward Erin Spence appeared to be breaking free for a golden opportunity, but center back Alex Samuelson was rock solid on the back line of defense, repeatedly turning Spence away. After 15 more minutes without a point in the second half, Allie Ehlers took a free kick from about 30 yards away and directed it toward the goal. A stiff wind knocked the kick down and forced a bounce that fooled Aspen keeper Jessica Coxon for a 1-0 lead. Two minutes later, Coxon couldn’t handle a long ball forward and Jazmine Swindler was there to take the rebound and finish easily. After so much time with a scoreless draw, the 2-0 Bulldogs lead looked huge. But as quickly as the Bulldogs built their lead, it disappeared. With 21:45 left on the clock, Moffat County committed a foul just outside the penalty area, which the Skiers converted for a goal. On the ensuing possession, Allie Ehlers was whistled for a foul near midfield. Melody Lemke took the free kick for Aspen and played it near the goal, where Moffat’s Hannah Walker looked to clear it. But Walker’s header came off in the wrong direction and dropped into the Moffat County goal. The Bulldogs once again were the team that attacked more in the remaining time and tested Coxon several times, but the Aspen keeper was up to the task. Then, with less than two minutes remaining, MCHS gave up another free kick from in close. Delaney Baker jumped out to grab the ball but didn’t catch it cleanly and the Skiers were able to score the game-winner in the scrum that followed. Both teams entered the game at 3-3 in Region 3 play, so Aspen’s win puts them in the driver’s seat of the playoff race. But the Bulldogs’ playoff hopes still are alive, beginning with a game at Roaring Fork on Monday.